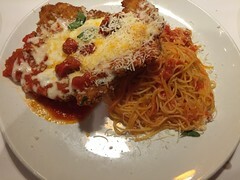 When I think Italian comfort food…I think Chicken Parm. It’s delicious and filling and has all the textures and tastes I love about Italian food. Macaroni Grill has some excellent food. Service is always great. This chicken parm was up there…as in…one of the best I have had in a long time. Lightly crispy, well-seasoned, and cooked perfectly. Sadly the capellini that came with….not so much. It was mushy…almost gummy texture to it. I am not talking al dente. I am talking noodles soaking too long and they are just exhausted. Other than that, this was a fine dish that I would order again…just with a different pasta side. I don’t often visit Romano’s Macaroni Grill – but after today that might change. They have this new thing going on called “Romano’s Kitchen Counter”. It’s a limited lunch menu that is ready to eat in seven minutes- at a cost of seven bucks per dish. What you see is the Chicken Milanese Panzanella salad. 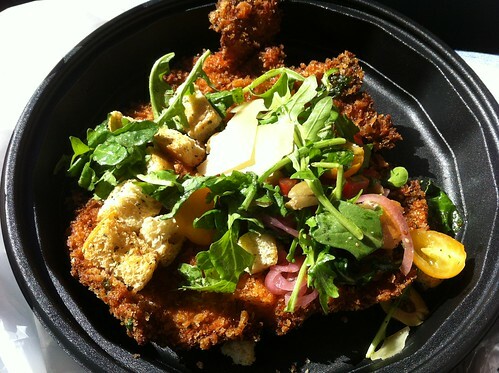 It’s a HUGE breaded chicken breast that is covered tomatoes, arugula, pickled onions, olives, parmesan, and a mediterranean vinaigrette. This was hearty and very-very filling. I got it to go and the idea of being able to walk in and ….by the time you pay and sit down… you get a dish like this is pretty slick. 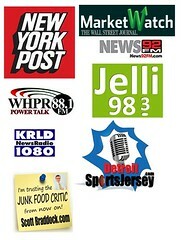 With no shortage of Italian restaurants – it must be murder trying to get and keep the attention of loyal customers. For Romano’s this is a step in the right direction. This lunch was so filling I couldn’t even polish it off in one sitting. And more than being a satisfying lunch…it make me curious and interested to check out Romano’s more often.